Enter the number of days that SafeSend should make your information available for. Note: The link to your data is still only valid for a single view. Generate multiple links to give to different people. 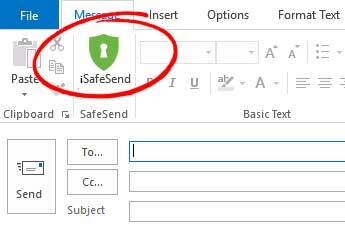 Use iSafeSend to encrypt and safely send sensitive information via email. iSafeSend generates a unique one-time use link to your sensitive or confidential information. This unique link is accessible for a limited time and once it has been accessed or reaches its expiry date, it is deleted and can no longer be accessed. iSafeSend allows you to send multiple unique links in separate emails for the same confidential information. A. iSafeSend an easy and secure way to share sensitive data. Q. How does iSafeSend work? A. . iSafeSend enables users to create shareable links that when clicked, give recipients access to the sensitive data that you are sharing. This data can only be viewed once, and after being viewed, it is deleted. Since these links can only be viewed once, recipients should not forward the links to other people. Q. How do I use iSafeSend? A. Visit iSafeSend.com and enter the text you wish to share. Specify the number of days until the links expire and select the number of links you wish to generate. Remember, each generated link can only be viewed once. If you are sharing information with multiple people, each person needs to receive their own unique link. A. All data is encrypted and as soon as the shared text is viewed, the data is permanently deleted. However, there are steps you should take to help keep your information secure. When sharing usernames and passwords, separate the communication of this data. For example, use an email to send the login URL and associated username and send a separate email, using iSafeSend, with a link to the password. This further decreases the risk of someone accessing your confidential information. Q. What happens if someone intercepts the iSafeSend link and views the data before the intended recipient? A. If the recipient of an iSafeSend link is unable to view the encrypted data because it has already been accessed, you will know that there is a security breach. Immediate action can then be taken to mitigate risk. Q. What does iSafeSend cost? iSafeSend is available as a Microsoft Outlook add-in. Simplify the sending of secure messages with the click of a button. The Microsoft Outlook add-in is available free-of-charge to current partners and customers.